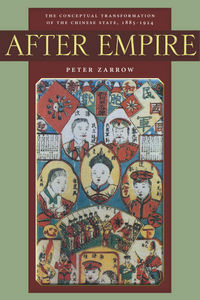 Ambitious in scope, Peter Zarrow’s After Empire: The Conceptual Transformation of the Chinese State, 1885-1924 is a descriptive and analytical history of the intellectual currents that swept away China’s edifice of kingship and erected a new polity. The new polity was oftentimes confused and ambiguous, but clearly the spell of emperorship was broken. This conceptual transformation began while a conservative Confucian understanding of monarchy still had a strong grip on the imagination of the masses. The Qing dynasty held the Mandate of Heaven; the Qing ruler remained integral to the cosmic order; and the social hierarchy depended on the monarchic principle, which anchored society in place. In the spiritual realm, this monarchism assumed religious trappings in rituals and symbols, sacralizing the emperor in his person. Into this comprehensive imperial system, Zarrow injects the question: how did this conception of the political and social order transform into the republicanism of the early twentieth century? How Influential was Western Political Thought? Popular accounts of China’s history point to the humiliating defeat of the Qing in the Opium Wars (1839-1842,1856-1860) that sparked the paroxysm of violence in the Taiping Rebellion (1850-1864) and the Self-strengthening Movement. The clash of West and East, in this narrative, laid bare the intellectual bankruptcy of the late Qing, which set the elites scrambling to adapt to Western norms in order to modernize. Zarrow proffers a more nuanced account. While this West-East confrontation indeed forced late Qing elites to examine their governing system, this examination also had indigenous motivations. Military defeat was complemented by deeper, structural issues: there was not enough land distributed for farmers to survive and the population explosion overwhelmed administrative resources. But more importantly for Zarrow’s work, late Qing intellectuals looked to their own heritage, working within a non-Western framework, to reformulate China’s polity. Western political theory acted as a subversive element, but the building blocks remained Confucian, at least initially. Zarrow demonstrates this indigenously-driven transformation of China’s governing order by surveying key intellectuals within their historical milieu and the resistance they faced. By the end of his survey, readers are acquainted with the constitutionalists (or “radical reformers,” “constitutional monarchists”), late Qing conservatives, and revolutionaries. Yet Zarrow’s significant contribution is teasing out the intra-divisions among these three broad categories and hence providing a messier, but more accurate, vision of China’s political climate at the turn of the century. In the 1870s to 1880s, low-ranking officials and non-official gentry walked the “road of speech,” which appealed to the emperor for a stronger anti-Western posture. In 1885, the Empress Dowager Cixi closed this road after concluding the Sino-Franco War, only to be reopened by the Guangxu emperor and closed yet again in 1898 when Cixi wrested power. Zarrow argues that by the closure in 1898 and the expelling of several key reform-minded intellectuals, there was a shift to “popular power” (minquan). In fact, Zarrow writes “this entire book is about the transition from the road of speech to popular power,” (p. 19) which took another decade to culminate in the 1911 Revolution. Before the 1898 expulsion, constitutionalists were already making intellectual headway. Among the constitutionalists, Zarrow focuses primarily on Kang Youwei and Liang Qichao, and to a lesser degree Yan Fu, Zhang Binglin, and others. Kang Youwei applied New Text Confucianism in creative ways, removing the sacred mantle from the emperor and placing it on Confucius and the ancient sage-king. In so doing, the emperor’s legitimacy stemmed from following this revisionist version of a democratic Confucius. Kang supported the monarchy, but a constitutional one; and even more, a monarchy that sought reforms that would eventually reduce the emperor to a powerful uniting symbol, but a symbol nonetheless. Liang Qichao, Kang’s protege, was more radical and went through several phases. The first break with Kang was his rejection of New Text epistemology, on which Kang’s whole enterprise rested. Without the sage-king Confucius, Kang lost his principle of legitimacy. Liang rejected Confucianism as a stricture on intellectual freedom, the very thing that progress required. Yet later he shifted from a more pluralist understanding of society to advocating a centralized, disciplinary state. This birthed a “statist” doctrine whereby the nation served to uphold the state. In the end, Liang settled on a doctrine of the “organic state” where the social contract tied the state and the people together in an egalitarian mold. After 1898, both Kang and Liang Qichao spent time in Japan, along with other exiled thinkers, where they studied the Meiji restoration. Since study of Western political thought in Japan was already well underway when they arrived, Japanese language acted as a medium for Western political concepts to enter Chinese vocabulary. These late Qing intellectuals did not swallow whole the ideas of democracy and equality. No, many thought these “Western” ideas in fact originated in the East with philosophers such as Mozi (egalitarianism, free love), but were later discredited by Mencius. Hence it was natural that Kang, Liang, and other constitutionalists would face resistance, even from those who agreed that reform was needed. One such reformer that Zarrow treats in detail is Zhang Zhidong. Known for a moderate traditionalism, Zhang was reform-minded, but feared that democracy would overthrow the dynasty. The imperial state upheld the social order and together, the imperial state and society, were rooted in the cosmic order. Late Qing conservatives did not see the state as the highest good, but rather the “unity of governance and the Teaching” (zhengjiao heyi) created order while dynasties and states rose and fell. More stringent reactionaries could be found in Hunan. For them, hierarchy created a social order in which all entities stood interconnected. The empire and the family ran parallel to each other. To lose one was to lose the other. To lose the patriarchal emperor was equivalent to losing the father, and hence to lose the imperial order was to lose the family as well. While moderate reform was necessary, these should be focused on technology and infrastructure. This incremental transformation flowered with the revolutionaries. Though the revolutionaries differed widely on a whole host of issues, Zarrow pinpoints three unifying ideas: history is progressive and linear, China’s minzu identity is based on race and culture, and a good society recognizes equality (pingdeng), popular power (minquan) and human rights. While the first and third ideas are common to the constitutionalists (e.g., Kang, Liang), the second is in sharp contrast. (Note that many revolutionaries believed in constitutionalism, but without monarchy, as Kang advocated). Revolutionaries were anti-Manchu, while constituional reformers did not see Manchus as the main problem. In other words, for the revolutionaries, the nation was prior to the state. They wanted China to be a nation-state, based on minzu, as opposed to a civic-state based on citizens (guomin). Revolutionaries found democracy and egalitarianism rooted in ancient Han culture and the sage-kings, while despotism was slavery imposed by the invading Manchus over the Han people. Depostism was the public realm made private property by the ruler. Again, constitutionalists agreed with the revolutionaries about the public realm being the property of the people rather than that of a dynasty or empire, but disagreed with the racial coloring. Anti-Manchuism as wielded by the revolutionaries was not a scapegoat to blame for the relative decline of China, but part of a grander narrative of reimagining the essence of the state. Yet another strain of political thought was the New Culture Movement, personified by Chen Duxiu. In trying to pair individual morality with a republican polity, Chen asked the haunting question, “What’s wrong with the Chinese?” His answer was Confucianism, which legitimated despotism and taught the people to desire slavery. Chen’s solution was moral education, not a political agenda. Moral politics was founded on a moral people. With this great shift in political imagination, it is no wonder that both Yuan Shikai’s self-proclaimed emperorship and the coup to enthrone Puyi failed. These events marked the dying gasps of the old order, rather than evidence of its salience. This new political imagination, though divided among several conflicting groups, used the language of a public interest implying popular participation. Late Qing and early Republic elites also shunted political theology as superstition and rather civil religion of teleology/progressive nature of constitutionalism. The primacy of the states, “statism,” remains in the political ideology of China today. Sun Yatsen viewed ethnic nationalism as equivalent to the state-nation because for Sun the Chinese people were already a nation, having been a single state since the Qin and Han dynasties. Subsequent dynasties were merely regime changes. But for Mao Zedong, who had a more theoretical understanding of the state, viewed the People’s Republic of China “not as a multi-ethnic nation but a multinational state. And not as a nation-state but as a socialist state, ultimately a more advanced stage in the progress of world revolution” (p. 288). Statism synthesized Mao’s dictatorship against class enemies and democracy for the masses. In this 296-page monograph, the depth of Zarrow’s research is on full display. By examining different intellectual heavyweights in turn, he explains in detail the cogs comprising each political thinker’s theory of the state. This is particularly the case in Zarrow’s treatment of Liang Qichao, whose political ideas take several sharp turns during his life and travels. But this deep dive is not without its effects on the book as a whole. After Empire oftentimes reads more like a textbook on Chinese political philosophy rather than an intellectual history. The larger narrative often disappears in the details and Zarrow’s concern for parsing out every philosophical nuance. After Empire should also be considered an interdisciplinary work. Zarrow addresses the more material aspects of this transformation by examining imperial religio-cosmological rituals, holidays like Double Ten, symbols such as the flag, and even the national anthem. This anthropological twist enriches the scholarship and shows transformations beyond this political philosophizing had real repercussion on the ground. The evidential value of these observations, however, remains inconclusive. Did the policy and philosophical debates among late Qing and early Republic elites actually filter down to the people? If so, by what mechanism? This causal relationship is implied, but left unaddressed. After Empire follows the same vein as Wang Hui’s seminal The Rise of Modern Chinese Thought. The intellectual history of Europe has been thoroughly mined and imbibed. Perhaps it is time for the rich legacy of Chinese political thought to join the mainstream and enter common discourse. After Empire, though far from a definitive work, is another monograph to add to the growing scholarship in this field which has been largely neglected among Western academics studying comparative politics and political thought. Zarrow challenges us to think about political developments in China from an indigenous framework or worldview.